To set the insert in place, position a pineapple and apple slice at each corner of the jar between the insert and the jar. Use the CQ Wand to push the slices all the way down. Decorate the rest of the jar using the CQ Wand to position the remaining slices as shown in the picture. Using the CQ wand to measure the water level, fill the CQ Mixing Bucket with 1.5 gallons of cold, filtered water and 1.5 gallons of pineapple juice. Add 1 pouch of CQ Peach Puree and stir. Next, place a metal strainer in the mixing bucket and muddle any apple and pineapple slices. This technique will ensure that no fruit pieces end up blocking the spigot later. Congratulations, you’ve just created CQ Peach Grape Ginger Juice Infusion! Fill the beverage container to the top with ice cubes (about 10 lbs.) and add the CQ Peach Apple Pineapple Juice Infusion. To refresh, add equal amounts of ice and CQ Peach Apple Pineapple Juice Infusion. 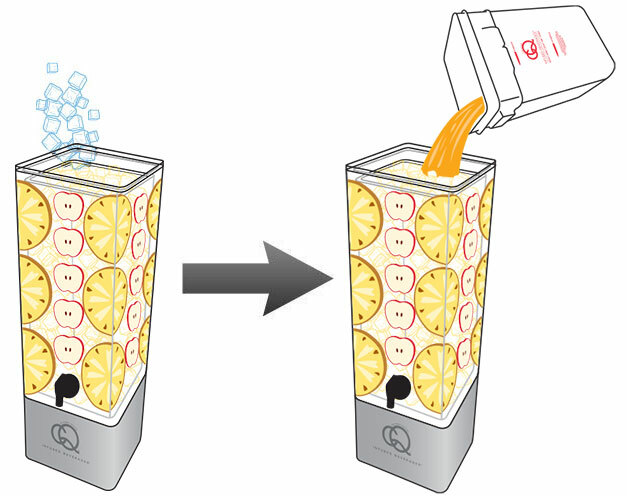 Air-dry and reassemble the CQ Infuded Beverage System. Store in a secure case or room.